Leeds University researchers have discovered a new non-porous material that becomes molecularly thicker when stretched. 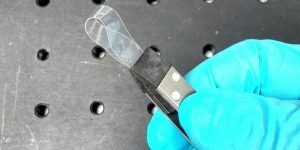 A world’s first, the synthetic material has unique and inherent auxetic stretching properties. This implies that when stretched, the material becomes thicker perpendicular to the applied force. There are many materials in nature that exhibit auxetic capabilities. Some notable examples are cat skin, the protective layer in mussel shells, and tendons in the human body. Scientists have been trying to create synthetic auxetic materials for more than 30 years, but it was only recently that they were able to make them by structuring conventional materials using complex engineering processes. Nevertheless, these processes are overtly time consuming, costly, and can lead to weaker, porous products. The Leeds study led by Dr Devesh Mistr has now identified a synthetic molecular version of the process, helping usher in products with a wide range of applications. The team discovered the yet-to-be-named material while examining the capabilities of Liquid Crystal Elastomers. Liquid crystals are best known for their use in mobile phone and television screens and have both liquid and solid properties. When they are linked with polymer chains to form rubbery networks, they have completely new properties and possible applications. “Our results demonstrate a new use for liquid crystals beyond the flat screen monitors and televisions many of us are familiar with,” said Professor Helen Gleeson, study co-author and Head of Physics and Astronomy at Leeds.